Copright of the artist%2C artist%27s estate%2C or assignees. 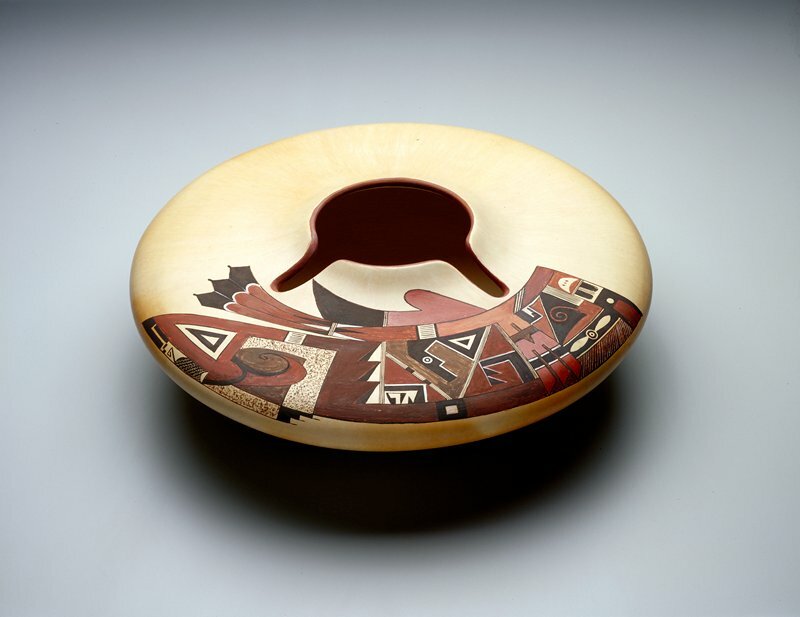 In the early 1900s, Nampeyo's eyesight started to fail, so she began to focus on building the vessels and left most of the painting up to Lesso and her daughter, Annie Healing. Pottery making is a family enterprise among Pueblo villages, which has allowed for Nampeyo to pass her legacy on to subsequent generations. Dextra Quotskuyva, Nampeyo's great-granddaughter, has been an extremely successful potter. Quotskuyva takes her inspiration not only from her great-grandmother, but also from her own life experiences. For this piece, Awatovi Birds, the artist re-imagined a portion of a mural in the ancient ruined Hopituh Shinumu village of Awatovi. Copright of the artist, artist's estate, or assignees.